Pistils of a Venutian Love Blossom…or a Polynesian War Tattoo…or glittering tentacles of an alien medusa …or possibly the placental vessels of a fetal dragon… reach out from the lake into the white crystal crust. For four years, I have been flying between San Jose and Burbank . Southwest's route often takes us over this remarkable geographic figure which, despite its visibility, seems unknown to most people except geologists and nature photographers. Soda Lake occupies the North end of the treeless Carrizo Plain…a velvet palette of solid green…or gold…or red brown, depending on the season…but that's only part of the intrigue. 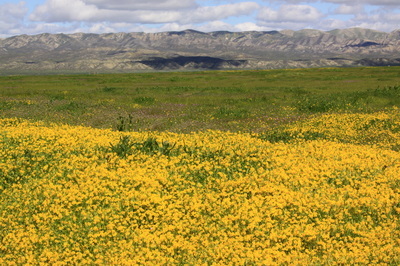 The San Andreas Fault rips down the Eastern side of the Carrizo Plain. The line is unmistakable…laser beam straight and visible on the surface for 40 miles. The ephemeral stream courses crossing the fault have all been disjointed over years of sideways slippage, so the fault line resembles a Big Zipper (not to be confused with the famous constellation). The Carrizo sports a famous spring bloom which, like all desert promises, can be fickle in both timing and scale. This year, with hearty rains since December, the bloom promised a spectacular show, but an early March cold stretch preserved floral modesty when I went there. 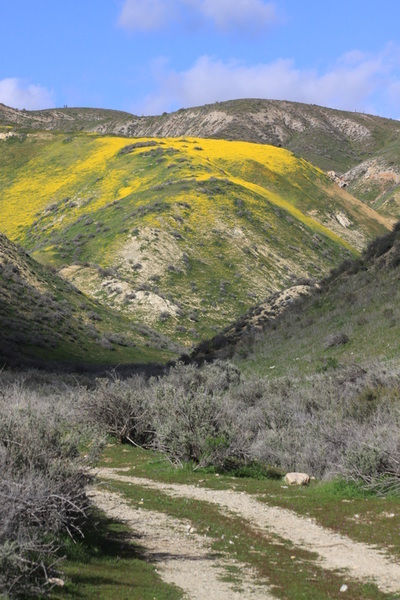 The yellow splashes on the hillsides of the Temblor Range were starting, but the orange, blues, and reds were hiding in the sanctuaries of their buds. I'm going to have to go back for the rest of the show! Driving around the Plain requires a map, some patience, and a tolerance for vibration. Soda Lake Road travels North-South along the West side of the Plain, with civilized pavement and long stretches of well mannered dirt, several campgrounds, and a really pleasant visitor center. But I was intrigued by the more primitive Elkhorn Road on the East Side . I crossed paths with only one other vehicle in a day. Elkhorn runs parallel to the San Andreas Fault, often within a quarter mile, with lots of enticing two-track side roads snaking up into the Temblor Range and its flanks of yellow daisies. This would be heavenly terrain with a mountain bike. Once well up into the canyons, environmentally responsible car camping is permitted on BLM land (check the map at the visitor center or on the web). A warning: The low-lying center of the Plain can teach two-wheel drive vehicles the true meaning of “wet clay” if it has rained recently. Dinosaurs that stepped into this stuff became fossils. Ask the visitor center before you try one of these routes. The Carrizo Plain is 3-4 hours from either the Bay Area, or LA, and it's only an hour diversion from either Hwy 5 or Hwy 101. Route 58 from 101 to the Plain takes you through some classically beautiful Central California oak studded hillsides, grassy valleys, and a profusion of poppies. 1. Fry chorizo sausage until crispy and hold aside. 4. Shortly before serving, blend in the sausage, test the level of spiciness, and augment if you wish with some pepper flakes. 5. Serve with strips of cheese across the top. 6. Open a bottle of Salamandre Coyote Cuvee and enjoy the star show.